At , we believe it’s our job to protect your whole health by providing superior, long-term preventive and restorative dental care. 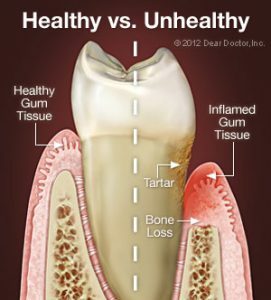 When your oral health declines, so does your overall health, as demonstrated by gum disease, also known as periodontal disease. Gum disease is not just a serious dental concern; it has been linked to heart disease and diabetes, as well as low birth weight in children born to women suffering from it. Periodontal disease is characterized by red, swollen, bleeding, or receding gums, as well as bad breath, painful chewing, and loose teeth. It starts when plaque is found in the mouth and hardens into a substance called tartar, which can only be removed with a professional cleaning. 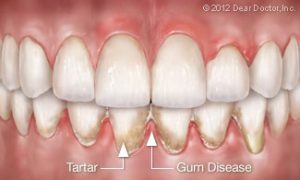 If plaque and tartar are not removed, the bacteria eventually cause a mild form of periodontal disease called gingivitis, in which the gums bleed and become red and swollen. Gingivitis is still reversible, and it can be treated with a professional dental cleaning and regular brushing and flossing. However, when left untreated, the gum disease worsens, leading to an advanced form called periodontitis that can cause severe damage to the soft tissue that supports the teeth, resulting in infection and eventual tooth loss. At AV Sierra Dental Center, Palmdale dentists Drs. Oh and Couto offer a variety of periodontal therapy treatments that address gum disease at its various stages. Periodontal therapy begins with a consultation and exam, so Drs. Oh and Couto can determine the stage of the disease and develop a treatment plan. Professional dental cleaning: Dr. Oh or Dr. Couto will remove the plaque and tartar from above and below the gum line. If you have gingivitis or signs of periodontitis, you will be required to have this level of cleaning twice a year or more. Scaling and root planing: Plaque and tartar are scraped away from both above and below the gum line while under local anesthetic (scaling). Rough spots on the tooth root are then smoothed out (planing). Locally applied medications, such as antimicrobials and antibiotics, may be used. After you receive your treatment, you will be given instructions on specific oral hygiene techniques to use regularly at home. In severe cases of periodontal disease, surgery may be required to remove deep pockets of harmful bacteria. When is gum surgery necessary? Gum surgery becomes necessary when the gum tissue around the teeth is too unhealthy to be repaired with nonsurgical treatments. How can you prevent gum disease? Routine professional dental cleanings and regular at-home oral hygiene practices that include brushing and rinsing at least twice a day and flossing regularly will help prevent both gingivitis and periodontal disease. During a gum graft, tissue is taken from the roof of the mouth and attached to the affected gum line, allowing more tissue to grow and cover the exposed root surface. What is a gum or periodontal abscess? A gum or periodontal abscess occurs when a pocket of pus collects within the gum. It happens when tissue disintegrates as a result of a bacterial infection in the gums or tooth roots and supporting bone. Gingivitis and gum disease are preventable and treatable. If you are concerned that you might have periodontal disease, call 661.202.3542 to set up a consultation at our Palmdale dental office today.